It's Not Summer Without You is a beautiful novel, and though it has a very sad start that finds Belly in the midst of her grief, Han captures the turbulence of emotions, the difficulties of death, and the love and history and complexities of Belly's relationship with Conrad and Jeremiah quite well. Like the year before when Belly attempts to get the boys to see her as more than a kid, there are a lot of misunderstood feelings and misread deeds that lead to complications and drama, but once Belly and Jeremiah start moving past that, Belly and the boys really do reconnect at the beach house in Cousins (with its gorgeous setting and vivid descriptions), and their shared love for Susannah and the beach house helps them come together to save it, although it doesn't immediately fix everything. Han's characters are flawed and fascinating, and though you may think you can anticipate what they'll do next, they often surprise you in the best and worst of ways. 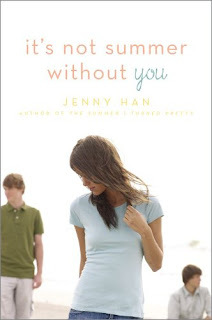 Though the novel is pervaded with grief and heartache, It's Not Summer Without You is hopeful and full of love, all about connections and making amends, and the fragility and endurance of relationships. Like with The Summer I Turned Pretty, this sequel has a rather ambiguous ending that will leave you curious, sad, wondering, and eager for the third book and the fate of Belly and the boys. Cover Comments: I love the simplicity of the white background and the beach scenes with the main characters. It's clean and beautiful, and it just seems so summer-y--I love it. I've been wondering about these books, I really liked the covers and I think you have convinced me to try them out. I thought this book was amazing. It kept me turning the pages and the way the author ended the book makes me unable to wait to read the next one! I loved it so much that i recommend it to any teenage girl out there! I recommend the trilogy to any girl teen !